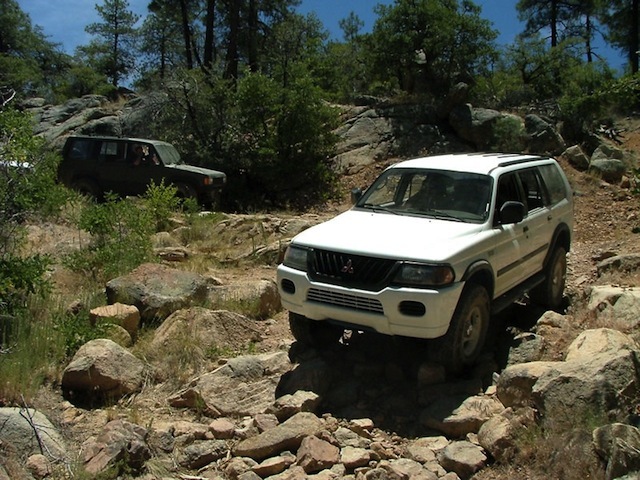 We made good time as we climbed in elevation in the Mazatzal Mountains on FR143. This road eventually ends at Punkin Center NW of Theodore Roosevelt Lake. 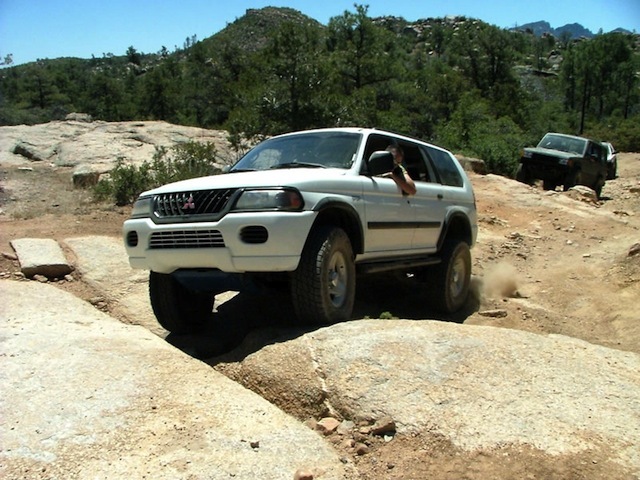 The trail rises to over 5,000′ and reaches a saddle at Pine Mountain. This is where FR422 heads north leaving FR143. 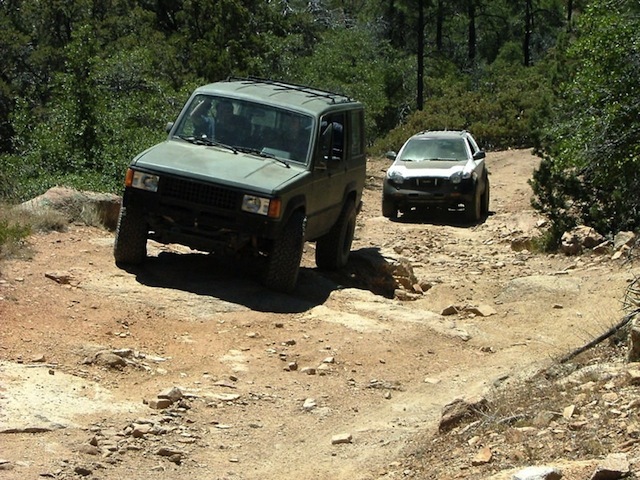 This road is still tame and has a few steep climbs, but traction is good. At FR463 (N33 44.741 W111 22.175 NAD83) we left the main the El Oso mine trail (FR422) and start on the Joline Mine trail. This is where all of the challenges are encountered. 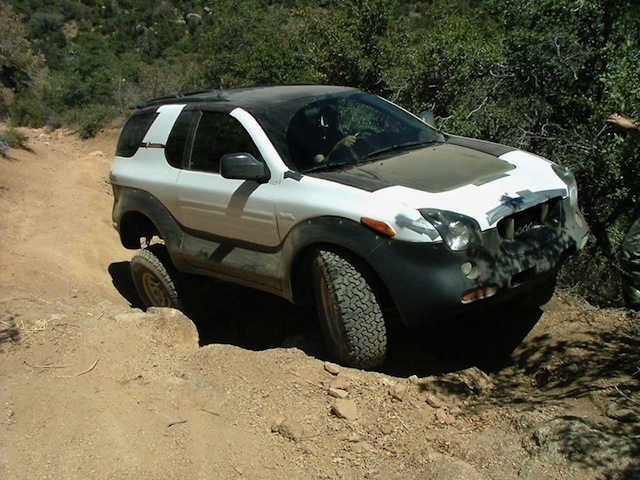 Within a few hundred yards of FR463, the trail yields some challenges, including some nice slabs that will test the suspension travel of the vehicle. 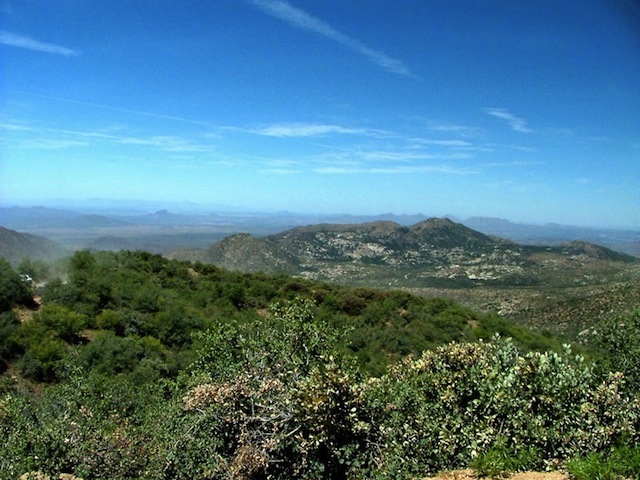 This portion of the trail runs along a ridge overlooking Big Pine Flat, with some nice views. This area was damaged by fire many years ago, and is just now recovering. The brush here is very tight, and is the worst you will find throughout the loop. 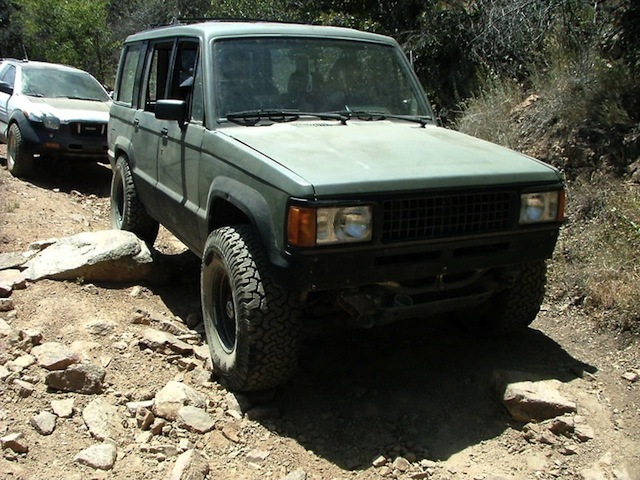 As the trail descends into the canyon the rocks become larger and proper wheel placement and clearance is more of a factor. 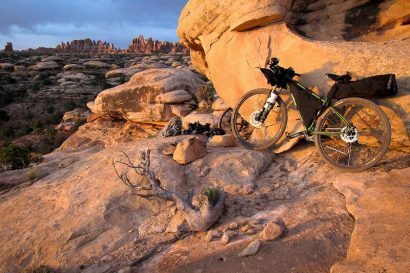 The first major rock section requires dropping down a hill over a rock outcropping and making a tight right hand turn into a series of loose boulder areas, the last being cambered and narrow. This section would be much more challenging if it had to be climbed. The trail continues to descend towards Bull Basin, winding through dense trees and several dry creek beds. 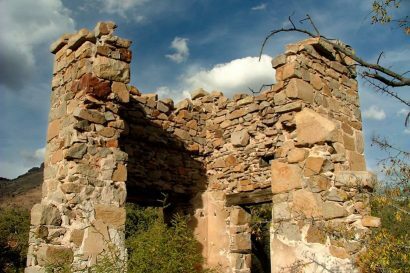 The El Oso Mine horizontal shaft is located on the west side of the trail within several feet of the track. This is a very well preserved mine, with ore cart tracks still nailed to 100 year old timbers. The mine should be entered with caution and at your own risk, but the impressive support timber structures, multiple shafts and rich quartz veins are well worth the risk. 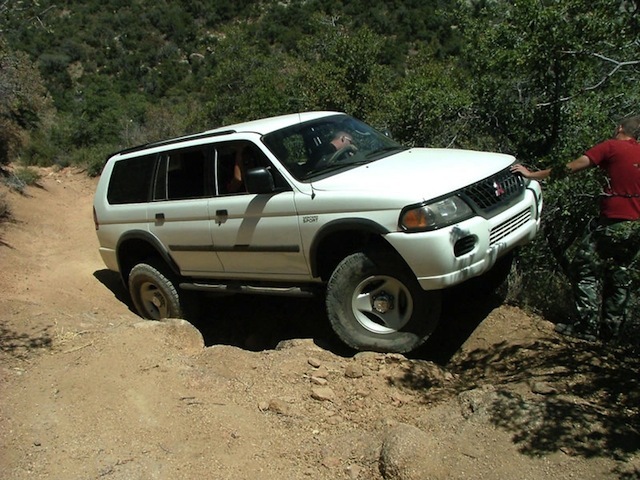 After checking out the mine we continued towards the Joline Mine Spur. 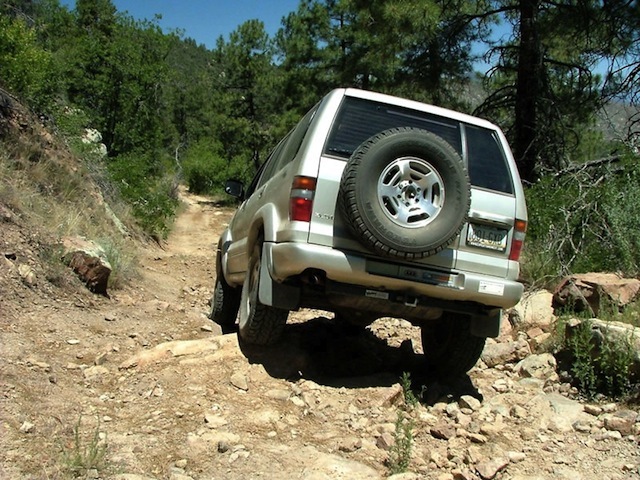 There are a few more crossed axle challenges along the way with close brush, and some cambered sections. At ~2.4 miles, the trail turns west, or straight. The trail straight ahead (NE) leads to the Joline Mine (horizontal shaft). 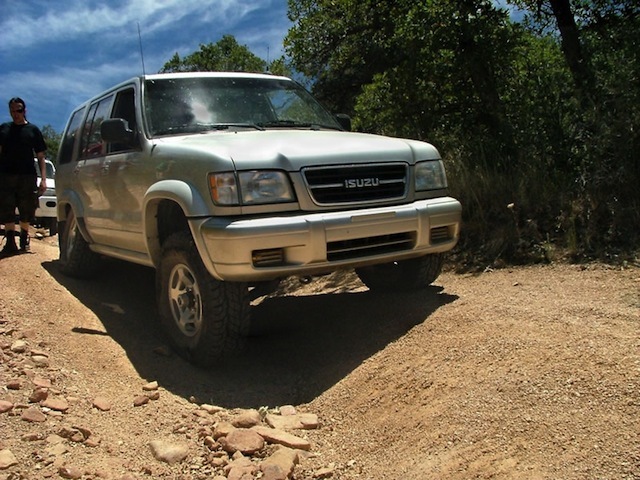 There are not many places to park at the mine, which is alsio the end of this section of the trail, so turning around is somewhat difficult. There are a few trees around, so we decided to have lunch there. After turning around we worked our way 150 yards back to the main trail and the turn west. 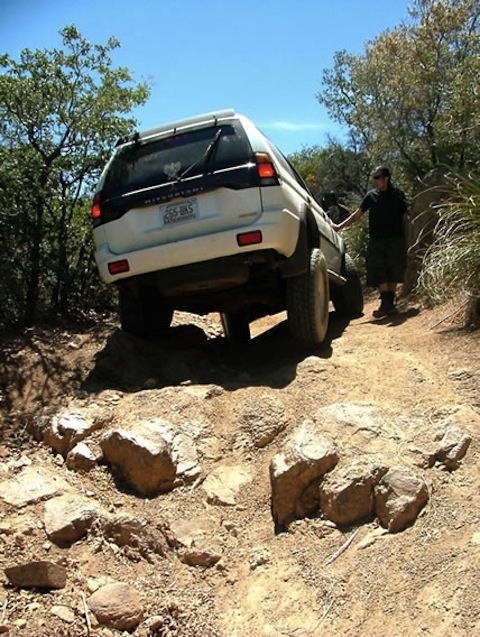 The trail immediately begins to climb, with several loose, crossed axle and cambered obstacles. 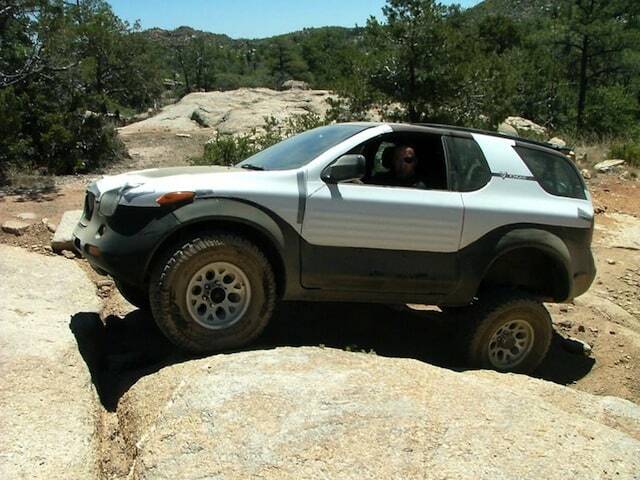 The open diff vehicles really struggled here, requiring several attempts. 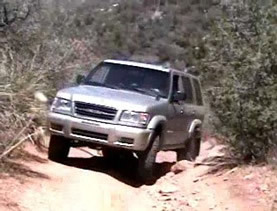 After the loose start of the climb, the hill gets even steeper, with several gully’s to straddle and more crossed axle holes. About 2/3 of the way to the top the major challenge of the climb is encountered in a 2 foot ledge with several 8-12″ rocks embedded in the surface. 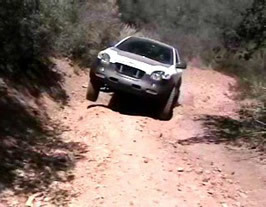 The Montero, with its open diffs and stiffer suspension, struggled the most but made it through the obstacle without a strap. Nathan did a great job of listening to his spotter. Eric climbed the ledge with very little wheel spin, taking advantage to him, as he did a great job driving and spotting. 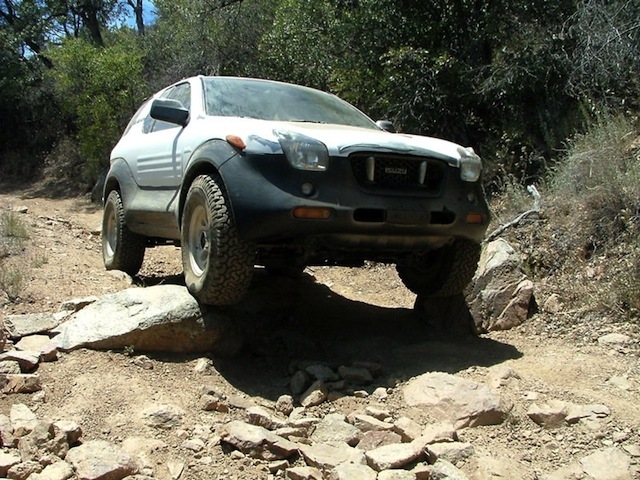 The Vehicross was the last to attempt the ledge and cleared the obstacle after some minor line changes. After the ledge, the trail becomes much easier and soon rejoins FR422 (N33 46.417 W111 23.211). We had a great day, with perfect weather and a few challenges to keep things interesting. 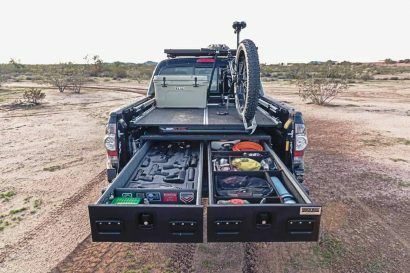 All of the vehicles and drivers performed great, with none requiring recovery or repair.